Thinking about putting in a stone or brick or paver patio and wondering what you should use? The good news is that most commercial materials, properly installed, will be attractive and solid for decades, if not for generations. Of course the bad news is that not all materials are equal, nor are they equally available in all parts of the world. I've installed several sidewalks, patios, etc., with various kinds of pavers, and I've documented two of those installations in detail for our readers. I've also watched how various installations have held up over the years. So, with the understanding that some of these materials may be unavailable or prohibitively expensive where you are, I'm putting together a list of the pros and cons of the materials you're most likely to encounter. The most common "pavers," "paving stones," and "paving bricks" sold in garden centers and big box hardware stores today are quick-cast concrete in various formats. 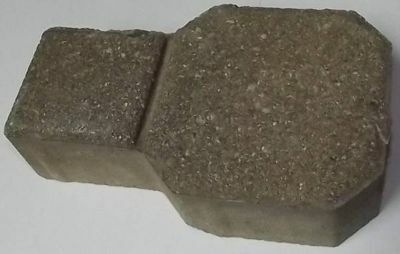 Quick-casting involves using just enough moisture to let the concrete/cement mix glom together and churning them out of the molds while they are still wet. Quick-cast units are very porous, which means that rain will only pool on them if the ground beneath is saturated. They tend to have rough surfaces and rounded edges, but that doesn't bother folks looking for a rustic or old-fashioned look. They're also available in a bewildering array of sizes and shapes, including a few shapes that, properly installed, stand in nicely for century-old cobblestones or flagstones. They have one minor disadvantage - they lose their color faster than any of the other materials. That's because dies and paints can never really color silica crystals (sand), the main ingredient in this kind of material. What they color is the "dust" between the crystals. That dust wears away faster than the other components, allowing the overall tone of the unit to go back to a sort of gray, no matter what color it started out. The good news is that this usually takes a few years, and the units' structural integrity will stay sound for decades. So if you do a driveway or patio of these, and you give them a good foundation, they will out-last you, even if they do go gray a little faster than you do (hopefully). The only other thing to watch out for is that, because they are so porous you should avoid installing them where they'll have continuous exposure to dampness, such as under rain gutters or air conditioning units, or in chronically low, damp spots in the yard. They will gather moss and or discolor much more quickly if they don't have a chance to dry out thoroughly between rains. If you use the "brick" version of these (usually 4"x8"), the installation instructions in the following two articles should be helpful, even though we used different materials. These are the best and most expensive concrete solutions. They use the same kind of concrete as, say, the slab under your basement, and they have to cure before they're removed from the mold. Because they take much longer to make, they cost more. They're heavier and far less porous, which means that the mortar or sand you use between them had better not be waterproof. They'll also have a more authentic appearance than the quick-cast units, and they keep their color longer. Real Stone - Usually real stone is "off limits" because of the cost. Repurposed limestone is sometimes used for "flagstones" here in Ohio, because so many of the 18th and 19th-century farmhouses and barns used stacked limestone foundations. If you go this way, plan on using a lot of sand underneath, to compensate for the differences in thicknesses among the pieces. They are a lot of fun to "jigsaw-puzzle" together, and the final look is very old-timey and authentic. If you want a sidewalk or patio that is smooth enough for folks to use walkers on without tripping, though, these aren't necessarily the best solution. Sometimes quarries or the guys who install granite countertops sell granite "stepping stones" or "pavers" made from the sink cutouts or remnants. Outside of being relatively slick when it rains, this should hold up very well. Still, the cost is almost always prohibitive for any project larger than a few square feet. Occasionally you'll come across cut stones with smooth edges and consistent thicknesses. 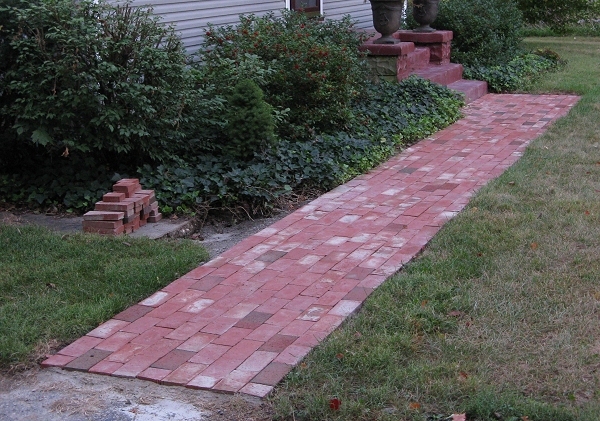 For most of those, the basic "brick paver" installation rules apply. If you want a brick look with the most consistent, durable materials, professional paving stone suppliers (not big box store garden centers) provide a kind of 4"x8" paver that is made just like the bricks they use in houses, without the holes. They are far less porous and hold their color far better than the quick-cast concrete imitations. They are also better on both counts than wet-cast pavers. If you come across these, you can tell them from the concrete versions quickly - they have very sharp edges all the way around, the color is consistent, and you can not see individual grains of sand. 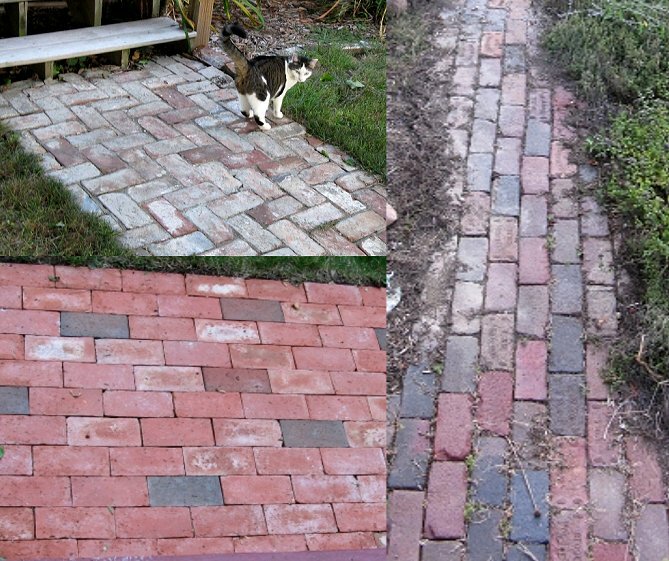 I used these in our article Dry-Setting a Paver Path, and that sidewalk looks exactly as good now as it did five years ago. These are the pavers that high-end builders use. Properly installed, they will last for generations. If you can get these for about the same price as the concrete version in your area, don't think twice. On the other hand, if they're going to cost you twice as much, take that into consideration. Here's one of my favorites, although they do not make good permanent sidewalks for high-traffic areas. So if you're relaying the sidewalk in front of a store, or widening a path for handicapped access, you'll want to consider something else. In Ohio, early settlers made their own bricks by compressing clay into wooden molds, then letting the clay dry for weeks, then firing the clay in homemade ovens. Because iron oxide (rust) was cheap, most brickmakers mixed a little in to give their bricks an orange or reddish tone. All of the bricks were solid. Size and shape were approximate. By today's standards they were fragile even then. That said, quite a few 200-year-old brick buildings in Ohio are still standing. When you see these old brick houses, you get the impression that they alternated full-length and half-length bricks on some courses. Actually, the "half-length" bricks are full-length bricks that are turned sideways, because the walls are actually two or three (usually three) layers thick, and the sideways bricks help hold the layers together. 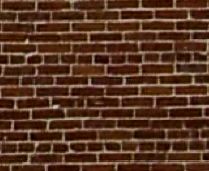 When you see those "star" decorations on some old brick buildings, you should know those are functional - folks install those when the mortar becomes so weak that the outer layer of bricks is threatening to peel away from the front of the house. Sadly, sometimes those houses do have to come down, usually as a result of long-term neglect. When the walls come down, a good proportion of the bricks break up. Those usually find their way to construction sites as "clean fill." But as you can see, even a small 1800s brick house has a lot of bricks. And the bricks that stay more-or-less intact are often salvaged. The mortar that held the bricks together is usually even more fragile than the bricks. So with patience and a ballpeen hammer, you can clean enough of the old mortar off to reuse the brick for something else entirely. Or you can buy the old bricks from someone who has already had this done. Solid bricks continued to be made for about a century. The later versions have more consistent colors and sizing, but they still have the same basic format. So if your brick pile includes bricks from 1830, 1860, and 1890, they'll all be close enough to use together in many projects, especially paving projects. Of course, brickmakers eventually figured out how to make the bricks stronger. Today's bricks - even with holes - are far stronger than they old clay bricks, and better for building with, but they aren't much use as pavers. 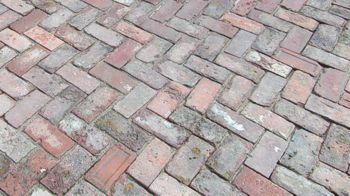 Reclaimed solid bricks are not nearly as durable as fired clay pavers (above), and they're usually less durable even than quick-cast concrete pavers. Laying them can be more art than science because they vary somewhat in all dimensions. But if you can get them from a source that has mixed them up and include several different colors and styles in your project, it adds all kinds of interest. It also makes your sidewalk or patio to look like it's been there for a hundred years, not just a few weeks. Regarding maintenance, the big problem with these north of the Mason Dixon line is that water can get into microscopic cracks in the bricks, then freeze, eventually causing the brick to crack (some folks say "explode") in place. If you have to drive over them for any reason, they're also more likely to fail than the other choices on this page. For young families who cherish the look of the old bricks, it's not hard to pry the remnants of broken bricks up and drop an "new" brick in its place. But hopefully you can see why using reclaimed bricks to build a functional sidewalk to a retiree's front door is probably a bad choice. A century ago many cities were using heavy fired blocks to pave their streets. Because they used the same pigments as contemporary solid housing brick, many folks confuse them, and you can't always tell the difference in photos. But instead of being 2.5 - to 3" tall like housing bricks, these are typically 4" high, and often larger in other dimensions as well. These are very hard to find for a reasonable price. I acquired a few when Springfield, Ohio tore up the old trolley lines under West Main Street. The contractors were just going to blacktop over the street when they were done, so they had no interest in the blocks (or the ties, some of which I also acquired). They just tossed the bricks in a pile at the end of each day. I was polite and only took a few home every day or so, letting the folks who actually lived in that neighborhood what they wanted. Now I see these selling for $3 or more apiece on Craig's list. Maybe I should have made a few more trips. I mention these for two reasons. One is that if you do come across these for $1 apiece or more, you'll know that you're not being gouged. The other is that lots of folks selling reclaimed house bricks (above) claim that their bricks came out of some street or another. 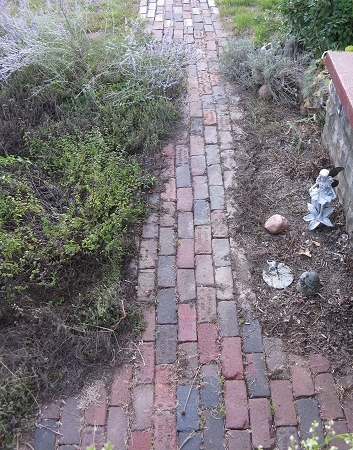 But the difference between clay house bricks and fired street pavers is night and day. Here, based on observation and experience in Ohio, is a sort of table that summarizes the relative advantages and disadvantages of each product. One thing that most big box stores won't tell you until they absolutely have to is how many units you need per square foot. That's because it can take a astonishing number of the smaller bricks and blocks to do a project, and they'd rather you fell in love with the materials before you realized how much they were going to cost you. The goofy shaped pavers are the worst. Most guys in the big box stores can't even tell you how many of the odd-shaped pieces you need to get one square foot - or they give you the wong information. So it's entirely possible to price out a project, borrow your neighbor's pickup truck, then find out later that you have half or 2/3 the pavers you actually need. The most common goofy shape is probably the paddle-shaped paver that is supposed to represent a larger and a smaller paver next to each other. One fairly reliable vendor claims that you need 3.5 of these stones per square foot. So you can see that the guy charging you $1.25 apiece for these is doing you no favors. Whatever format you use, make certain that you go over the math with your supplier, in case they have accidentally made false claims. 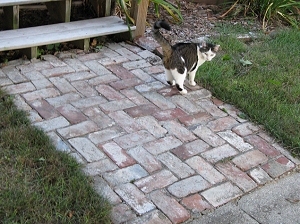 Paddle-shaped Paver 9.125" x 5.375"
Once again, availability and relative cost of these solutions will vary in your area. 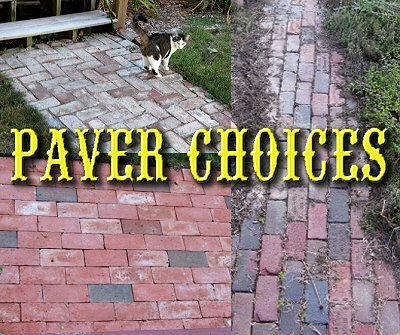 But I wanted to record what I've discovered for readers who are thinking about trying projects with pavers, to help you avoid unpleasant surprises. When you're doing your calculations, you also need to think about whether you need a dump truck full of sand, or edging, or some other investment that will add to the cost of the final project. I've had good luck shopping the used market, including garage sales and Craig's list. Materials from the secondary markets tend to be much cheaper, but don't make any purchase unless you're sure you'll have enough to finish the job (or a source to make up for any shortages). And don't assume that the used materials are cheaper. 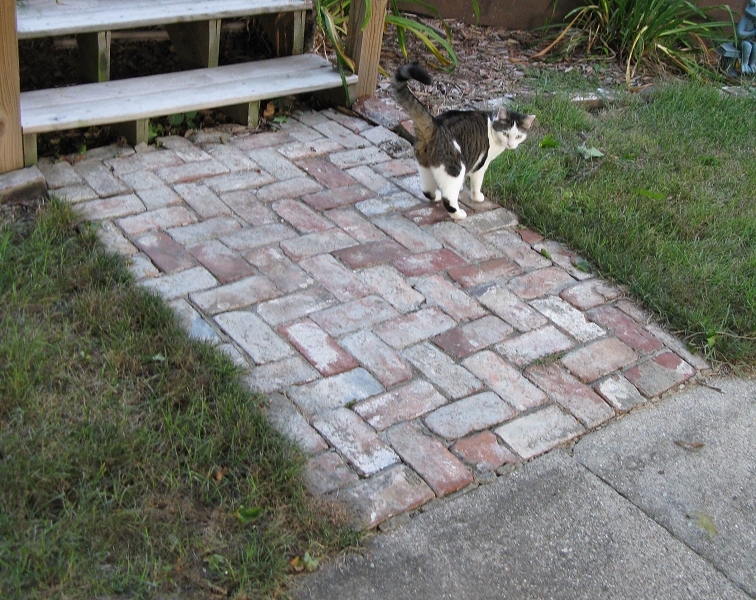 As I write this article, one local fellow is selling 6"x6" quick-cast concrete pavers for $1@. I'm sure it seems like a fair price to him. But that's $4 a square foot. And for that kind of money you can get top-of-the-line materials, even if you are buying retail. Please contact us if you have any corrections, additions, questions, or projects you'd like to share with our readers.